First I cut the legs off the pants. 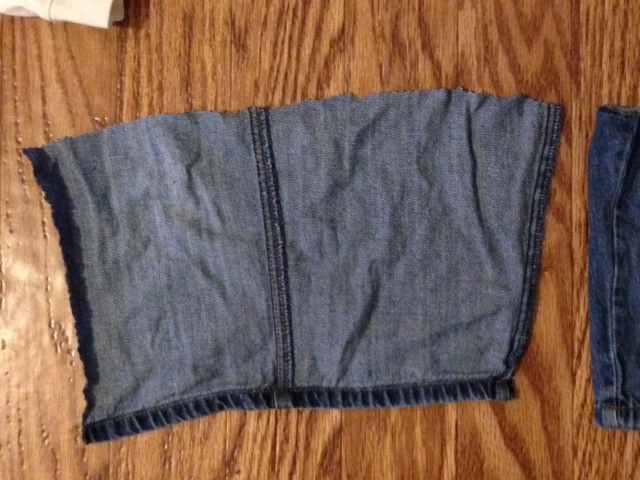 Then I cut up one side of each pant leg. Then I pinned the two pieces together on the bottom and both sides leaving the top open. I sewed these sides together. Now its nearly a pouch! NextI folded and pinned and then hemmed the top. Next I cut the monkey out of the onsie to use as a patch on the side of the pouch without a monkey on it. 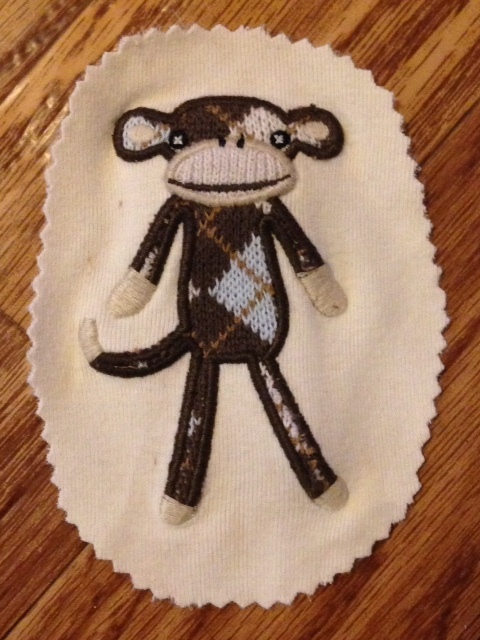 I pinned the monkey on and then chose a stitch to sew it on with. I didn't want to use a straight stitch- I wanted something a little more fancy for the patch. I had a little fold in the patch when I was done sewing as you can see above. Normally I would redo this but this is for my 3 year old and she won't mind! Next I wanted a way to close the pouch so I cut the snaps off of the crotch of the onsie. I pinned them to the inside of the pouch and sewed it on. So Im not the best straight line sewer and certainly there is room for improvement but this is my first attempt. 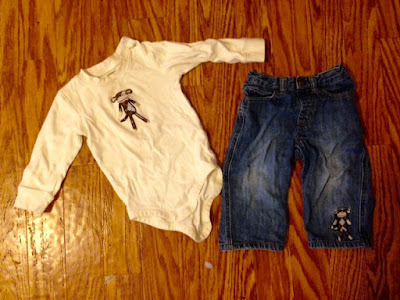 I thought about straps but found my kid liked it the way it was so I called this project done! Next time I will refine this process for better results! Does my confession of being into sewing already a faiiiir length of my life help, that I fear hardly aaanything more than to sew a straight, visible line, longer than 10 - 30 cm? At least a tiny winy bit? Please check yourself for the following in your own case: Since I have a rather short foot (22 - 23 cm with 'cheating shoes') I'm moooore under control of the speed of the sewing-machine, when stepping/starting the foot-petal rather with my heel instead of my toes. THIS provides me in turn with wayyy more time to concentrate on straightness and other things. Off you go - to continue with projects the like and I deeply regret you're not taking adoptions of elderly childish women like me to get things like this as well. ... and declare them 'new fashion' ? Thanks those are great ideas! I'm the same. I can't bear to throw old clothes out knowing I could use the fabric in some manner. Great job at turning it into a cute purse.